An illustration of the planned Galactic Suite Space Resort, set to open in 2012, its owners say. Spacefarers can book a three-night stay at the Galactic Suite Space Resort for $4.4 million, the Barcelona-based company planning the hotel has said. So far 43 paying guests have already reserved a spot, while more than 200 have expressed interest, Galactic Suite Ltd's CEO Xavier Claramunt told Reuters. Despite Claramunt?s confidence, critics have questioned whether the hotel can really be ready so soon, and whether the company has enough money to see the plan through. Claramunt said an anonymous billionaire has fronted the company $3 billion to finance the project. If it is built, guests can look forward to traveling around the world every 90 minutes or so and seeing the sun rise 15 times a day. Galactic Suite plans to transport its travelers to space via Russian rockets from a spaceport to be built on a Caribbean island. Guests will undergo an eight-week training course in the Caribbean prior to launch, Claramunt said. 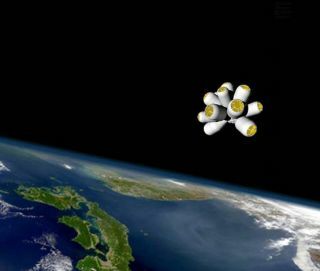 About 1 1/2 days into the space trip, visitors will arrive at the hotel, which is expected to be constructed of connecting pods around a central hub. Each pod will be able to hold four guests and two astronaut-pilots. "It's very normal to think that your children, possibly within 15 years, could spend a weekend in space," he told Reuters Television.